Special Editors’ Edition to Release Soon! Editors’ Edition to release May 5th! Hey fellow writers! The last fifteen weeks have flown by and we hope the end of the semester is wrapping up nicely for everyone. This year has brought the staff of 13th Floor Magazine on an exciting journey. We have flourished as a team, accumulated new staff members, enhanced our own abilities of writing and editing, and had the opportunity to collect wonderful, original work from our peers for our first three Issues. We have seen support, sponsorship, and publications from two faculty members: Margaret Lukas with her debut novel, Farthest House, and Lisa Sandlin with her short story, “Phelan’s First Case,” published in USA Noir: Best of the Akashic Noir Series. There have been exciting poetry and prose slams and can’t-miss reading events. We had the much anticipated release of Issue 2 and are currently going through our recent submissions for upcoming Issue 3. Many of our staff members will be graduating in a few short weeks, an accomplishment that has been achieved with hard work, time management, hours of workshopping, and late night editing, writing, reading….and rewriting, and rereading. 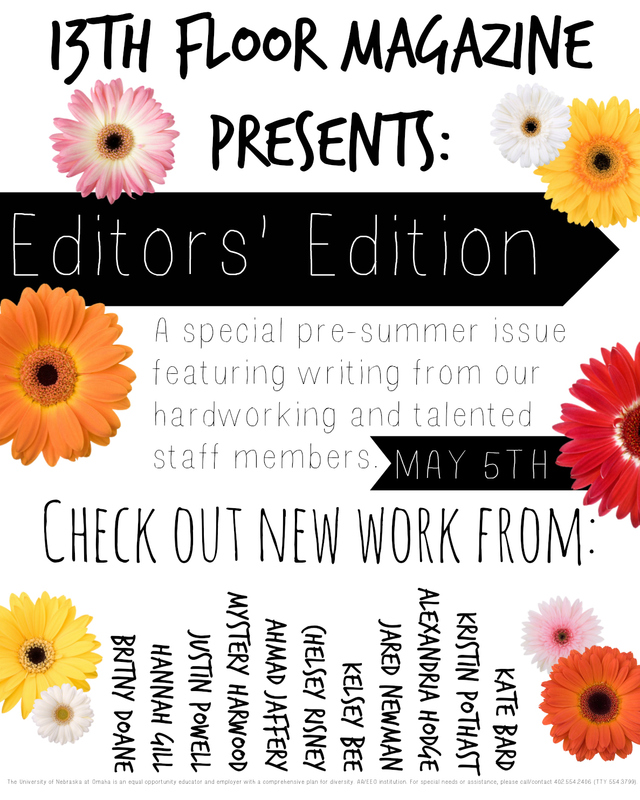 After dedicating ourselves to publishing the work of our classmates, we thought it would be fun to showcase our own work for a special, first time Editors’ Edition, which is due to release on Monday, May 5th! Quite a few of these graduating staff members were vital in 13th Floor Magazine’s creation, and being able to see our work on both the front cover and within the pages is a privilege. As you have all put forth great effort to share your creative, original work for Issues 1, 2, and 3, we want to showcase ourselves so that you, our readers, can get to know us as writers. Look forward to the works of Kate Bard, Kristin Pothast, Alexandria Hodge, Jared Newman, Kelsey Bee, Chelsey Risney, Ahmad Jaffrey, Mystery Harwood, Justin Powell, Hannah Gill, and Britny Doane. We are excited to share our best work with all of you! This Editors’ Edition would not be possible without the support of all our readers, contributors, and supporters. You are just as important to 13th Floor Magazine as we are. Thank you for allowing us to continue to bring a creative outlet for the arts to the University of Nebraska at Omaha. ← 700 Words Prose Slam This Wednesday!